Bodybuilders and fitness gurus alike all know that for muscle growth you need to eat protein. It doesn’t matter how hard and how often you train, your muscles will not grow without the amino acids of protein. Protein is the cornerstone of muscles and there’s no other nutrients that can substitute protein for muscle growth. If you want to build and grow muscle mass, its recommended that you should eat 1 gram of protein for every pound of your body weight a day. That’s a lot of protein that many people can not get by food and supplements are often necessary. If you’re not eating enough protein, then all the muscle building in the gym is just a waste. To optimize your muscle growth, what is the best time to eat protein? How and what type of protein should you eat to get a boost of muscular growth? First thing in the morning. After you’ve had a good nights rest, your body is at a catabolic state. This means that since your glycogen store is low, your body is burning muscle for energy.So just before brushing your teeth, eat a digestible protein like whey protein first thing in the morning so your muscles won’t waste away or catabolism. Between meals. 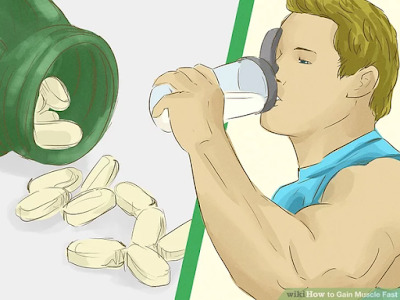 This is to maintain the protein flow to the bloodstream to feed your muscles continuously during the day, you can take casein protein in between your meals. Casein protein will slowly digest while it will continue to release protein to the bloodstream to feed your muscles between meals.That way your muscles are getting protein during the day. Before/After a gym workout. Eating fast to digest protein, like whey protein before a workout, will promote muscle growth as you are working out. Eating whey and some carbs after your workout will repair the muscles that you worked out. Before bed. Building muscle is at its best when you are sleeping. And since you will be without food for so many hours, you need to encourage your muscle growth by eating casein protein before going to bed. As stated before, casein protein is slow to digest and will constantly feed your muscles for as long as 7 hours while you’re sleeping, thus encouraging muscle growth. So now you know when’s the best time to eat protein. Follow these steps and watch your muscles grow just like you want then to.